Claire Robinson left a career in corporate America behind to follow her true calling. Turns out it was a good move. 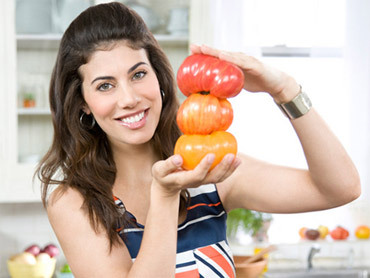 These days, she's the host of not one, but two Food Network Shows, "5 Ingredient Fix" and "Food Network Challenge." And now, another career milestone: Claire accepted "The Early Show Saturday Edition""s "Chef on a Shoestring" challenge and tried to make a standout three course meal for four on our paltry budget of $40. Not on that - her chef's hat was automatically entered into our "How Low Can You Go?" competition, in which the "Shoestring" chef with the lowest ingredients cost gets invited back to cook our year-end holiday feast! Place half of the dressing in the bottom of a large chilled salad bowl and top with mixed greens. Toss when ready to serve and garnish salad with additional raspberries. Note: Leftover vinaigrette can be stored in an airtight container in the refrigerator for up to 5 days. FOR THE MINI STRAWBERRY MASCARPONE RECIPE, GO TO PAGE 3. Preheat the oven to 400°F. Line a baking sheet with a silicone baking mat or parchment paper. Have a second identical sheet pan and parchment sheet ready. Stir the sugar and salt together and pour about half of it evenly onto a work surface. Unfold the puff pastry sheet and sprinkle the remaining sugar evenly over the top of the dough and press it a few times to adhere. With a rolling pin, roll the dough into a thickness of about 1/8 inch, turning and flipping the dough as you roll to incorporate the sugar into the dough and to keep it from sticking to the surface. With a 3-inch round cutter, cut out 12 dough rounds and transfer to the lined baking sheet; lay the other parchment sheet over the dough rounds and put the second sheet pan directly on top. Weigh the top sheet pan down with a cast iron skillet or bricks. Transfer to the oven and bake until crisp and golden, about 25 minutes. Remove the top sheet pan and parchment and cool the crisp rounds completely on the pan. Meanwhile, pour the balsamic vinegar into a small saucepan and bring to a simmer over medium-high heat. Simmer until thick and syrupy, about 4 minutes; it should still swirl in the pan. If too thick, simply add about a teaspoon of balsamic, stir, and remove from the heat. Put the strawberries in a small bowl and pour the hot balsamic syrup over them and stir. Let stand 5 minutes. To assemble the tarts, spread about 2 teaspoons mascarpone on each crisp dough round with a spoon or small offset spatula. Using a spoon to drain any excess liquid, place about one tablespoon of diced strawberries on the top of each tart. Any extra balsamic syrup can be drizzled over the tarts, if desired. Serve immediately. NOTE: The sugared dough scraps can be tossed with cinnamon and baked in the 400°F oven until browned and crisps as a treat for the little ones. Leftover strawberries or balsamic syrup is delicious over ice cream! So, how did Claire fare in our "how Low Can You Go?" competition?